Starting 1st October 2018, every e-commerce operator has to collect TCS barring a few exceptions. This article will give you information about how TCS works under GST. 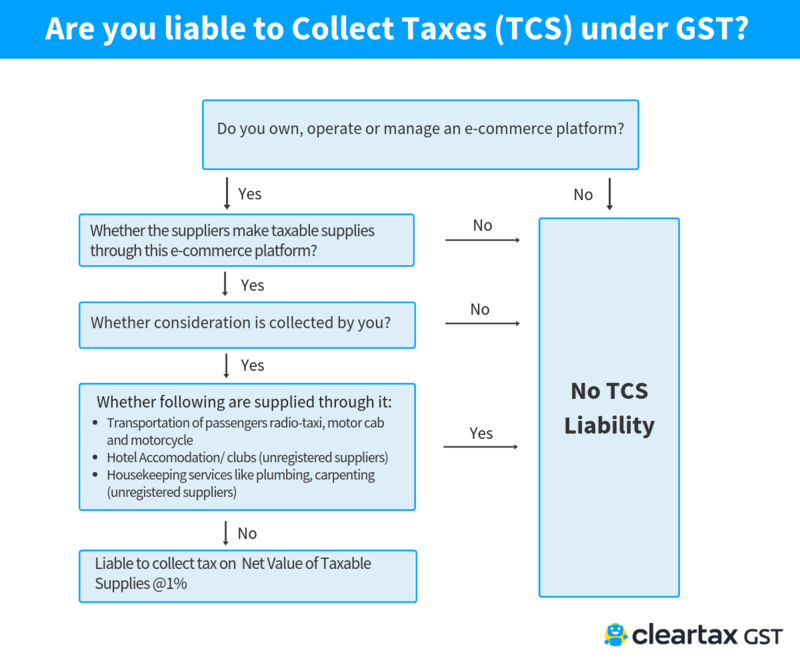 Who is liable to collect TCS under GST? When will the liability to collect TCS arise? What is the rate applicable under TCS? How to compute taxable value of the supplies for TCS? Which form can one use to file TCS returns? 1. What is TCS under GST? Tax Collected at Source (TCS) under GST means the tax collected by an e-commerce operator from the consideration received by it on behalf of the supplier of goods, or services who makes supplies through operator’s online platform. TCS will be charged as a percentage on the net taxable supplies. 2. Who is liable to collect TCS under GST? Certain operators who own, operate and manage e-commerce platforms are liable to collect TCS. TCS applies only if the operators collect the consideration from the customers on behalf of vendors or suppliers. In other words, when the e-commerce operators pay the consideration collected to the vendors they have to deduct an amount as TCS and pay the net amount. For eg – M/s XYZ stores (a proprietorship) is selling garments through Flipkart. Flipkart, being an e-commerce operator, before it makes the payment of consideration collected on behalf of XYZ, will be liable to deduct TCS. 3. When will the liability of collecting TCS arise? TCS will be collected by e-commerce operators while making a payment to the vendor. This payment will be the consideration collected on the vendor’s behalf for the supplies made by him via the online portal. This tax will be collected on the net value of taxable supplies. 4. What is the rate applicable under TCS? The dealers or traders supplying goods and/or services through e-commerce operators will receive payment after deduction of TCS @ 1%. The rate is notified by the CBIC in Notification no. 52/2018 under CGST Act and 02/2018 under IGST Act. This means for an intra-state supply TCS at 1% will be collected, i.e 0.5 % under CGST and 0.5% under SGST. Similarly, for a transaction between the states, the TCS rate will be 1%, i.e under the IGST Act. The e-commerce operator liable to collect TCS have to compulsorily register under GST and there is no threshold limit exemption for it. Also, the sellers supplying goods through the online portal of e-commerce players are also mandatorily required to get registered under GST except for a few exceptions. b. Every person who supplies through an e-commerce operator, except those who make supplies notified under section 9 (5) of CGST Act. Section 9 (5) mentions the following supplies – Transporting passengers by a radio-taxi and motorcycle OR providing accommodation in hotels, guest houses, for residential or lodging purposes (unregistered suppliers) OR services of house-keeping, such as plumber, carpenter etc( unregistered suppliers). In all three cases, the e-commerce operator shall pay GST, meet the compliances. Therefore, suppliers don’t have to register if they provide these services listed in 9 (5), provided they do not cross the Rs 20 Lakhs threshold for registration. c. Also, note that suppliers of services making a supply through an e-commerce platform are exempt from registration if their aggregate turnover is less than Rs 20 Lakhs (assuming they do not make inter-state supplies). d. Suppliers of goods supplying through an e-commerce platform are not exempt from registration. e. An e-commerce company must register itself in GST in every state it supplies goods or services to. 7. How to compute taxable value of the supplies for TCS? For eg – XYZ Ltd, a registered supplier is supplying goods through an e-commerce operator. It has made supplies of Rs. 55,00,000 in the month of Sep 2018. The goods returned were worth Rs. 5,00,000 to XYZ Ltd. during the month of Sep 2018. Here, the net value of taxable supplies for TCS collection will be Rs. 50,00,000 and TCS @ 1%, i.e Rs. 50,000 will be deducted by the e-commerce operator. Hence, the final payment to be made to the supplier is Rs 49,50,000. 8. Which form can one use to file TCS returns? E-commerce operators have to file GSTR-8 by 10th of the next month in which the tax was collected. This return will only be filed once the tax collected has been deposited to the respective credit of the government. For instance, the due date for GSTR-8 for September 2018 is on the 10th of October 2018. The details submitted by the operators in GSTR 8 will be available to all the suppliers in GSTR 2A. The supplies will be available GSTR 2A after the due date of filing GSTR-8. The tax collected will be reflected in the electronic cash ledger of the respective suppliers. The suppliers can claim the credit accordingly after matching and reconciling their supplies with the details in GSTR 2A. GSTR 8 cannot be revised once it is filed. 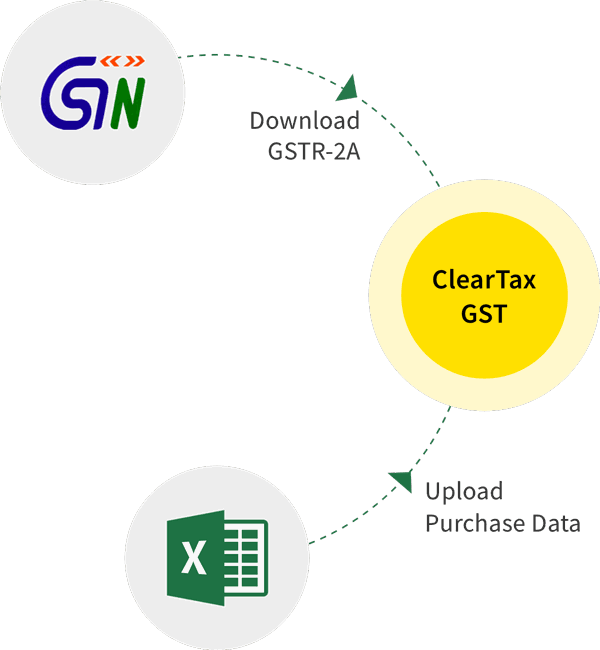 Any discrepancy found while matching and reconciling the supply data and GSTR 2A will be communicated to the operator and the supplier. If the discrepancy is not rectified within the given time period, then the tax amount will be added to the liability of the supplier. The supplier will have to pay the difference along with the interest if any. From the e-commerce operators viewpoint, they must register under GST in every state in which they operate before 1st Oct 2018, which is the effective date of implementing TCS provisions. The ERP systems have to be well integrated to apply these provisions in the day to day businesses smoothly. Moreover, the working capital of the suppliers selling through an e-commerce operator will be blocked until they file their return and claim the excess taxes paid. This can prevent SMEs vendors from selling goods or supplying services on the online portal. From the government’s viewpoint, tax evasion will significantly reduce since the tax will be collected at each and every transaction.